Teach Love Laugh: Literacy Love Struck! We have finally finished our Valentines Literacy Unit and we are so excited to share it! 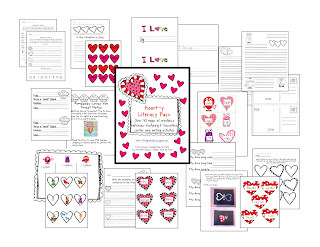 Thanks to KPM Doodles for having such inspiring clipart, we just had to get a jump start on some of next month's heart-themed literacy centers. We can't wait to show our kiddos! There are 11 fabulous literacy centers - writing, word work, and games! We hope you love this unit as much as we do! Please drop us a note if you do get this unit - we would love to hear what you think about it!